But Mr. Brock, the founder and chairman of Media Matters, makes no secret of the candidate he favors in the election: he hosted two fund-raisers recently that, he said, raised $50,000 for Mr. Obama. And John D. Podesta, a former chief of staff to President Bill Clinton who helped create Media Matters, is a chairman of the team that would facilitate Mr. Obama’s transition to the White House, should he win. “I’m a good progressive,” said Mr. Brock, who also gave money to the primary campaign of Senator Hillary Rodham Clinton. Though its sleek, glassed-in offices here on Massachusetts Avenue resemble the former law firm that once occupied them, the team of researchers search for the kind of “gotcha” moment that the organization might publicize. “The local guys are harder to listen to,” said Julie Millican, 26, who oversees the transcription and analysis of more than a dozen radio programs, from Michael Savage and Mr. Limbaugh to Chris Baker of KTLK-FM in Minneapolis and Dan Caplis of KHOW-AM in Denver. “They’ll go off and spend 20 minutes talking about a pothole in the neighborhood. The next thing you know, they’re calling Hillary Clinton a” — and here Ms. Millican used a vulgarity. 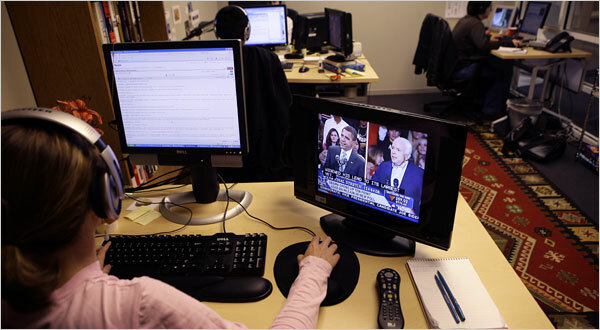 Whether Media Matters has affected the course of the 2008 election — by intimidating some reporters or commentators, or forcing a change in the tone of others — is difficult to judge, with no shortage of blogs now trying to do some version of what it does. While the book’s claims wound up getting little traction in the mainstream press, Media Matters was hardly alone in sounding the alarm. Moreover, for all the organization’s culling, the sheer number of items it pumps out can be overwhelming to those reporters who cover the news media, or the campaign. “If I were a Democrat, I would tell them to shut up,” Mr. Luntz said. “If I were a Republican, I would tell my candidates to ignore them.” And yet, the right should expect no let-up from Media Matters in the coming months, whoever is elected president, Mr. Brock said.